Viewing images on the new iPad is a real joy. Pictures come out in full resolution (no downsizing) and at 1536 x 2048 it's a real treat.The detail on screen is much higher than on the iPad 2 as a direct comparison showed. The photos app on the iPad differs from the one in the iPhone in two key aspects. First, there's the extra eye-candy - you can pinch-zoom your way back to gallery view here and into single photo view. There is also a small thumbnail bar at the bottom for quick picture scrolling. You also get the usual options available in the iPhone Photos app - you can select multiple pictures, delete them, copy them in other albums or share them. You can also preset a slideshow with adjustable transitions and music arrangement. 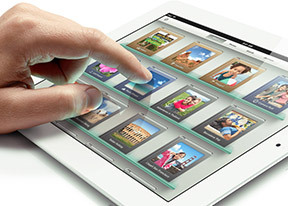 In case you are seriously considering using the iPad as a picture browsing tool you should get the iPad's camera connection kit that allows photos to be downloaded straight from a memory card. It is annoying to have to pay for such functionality, but it's the Apple way. If you've got yourself a desk stand, you can easily use the iPad as a digital picture frame when you're not using it. Unlike the iPhone, it has that functionality straight from the lockscreen. Just press a button and your photos start scrolling on the big screen. Generally the iPad situation is almost the same as before - you need iTunes to upload content, the screen is the awkward 4:3 aspect ratio, the device cannot stand on its own and it's too heavy to hand-hold for an entire movie and the supported video formats are quite limited. There is no DivX or XviD support (out of the box) either. iPad supports playback of MOV files all the way up to 1080p resolution out-of-the-box, but has some specific requirements for bitrate. We threw a few 1080p trailers in iTunes and only half of them made it through the sync into the iPad. Fortunately, by using a third-party player you can upload clips via the iTunes File Sharing service and upload any video file. It turned out this way we hardly had any limitations imposed by apple, we could play all MOV/MP4 files up to 1080p (incl.) resolution, even the 1080p videos shot with Canon 5D Mark II. Nice! By the way if you are checking out the videos you captured with the iPad camera through the Photos app the slate lets you zoom in on them. You can do that during playback or when the video is paused. It's not that useful, but it looks cool. There are a few video players into the AppStore that can save the day for DivX/XviD movies. The CineXPlayer handled more than 80% of the DivX/XviD videos we threw at it up to and including 720p resolution. The OPlayer is even more capable of playing almost anything up to 720p including MKV files. It also has better subtitle support with numerous encoding settings. Other less popular options such as the paid Azul media player and the free MoliPlayer will even present you the videos as big thumbnails with more style. Those have some extra features as well. But of course, you are free to choose whatever player fits your bill. Another possible way around the video limitations is the paid AirVideo app that lets you watch videos straight from your desktop computer streamed over your personal Wi-Fi network. Streaming over internet is in its early experimental phase as well, so the prospects are quite good. Since it uses your computer to do the transcoding heavy lifting, it also takes care of the limited number of supported codecs too. Generally, 4:3 displays such as the iPad's aren't much good for watching videos and there's a good reason widescreen displays are dominating the market currently. The iPad unfortunately is off trend in that respect. On the other hand, the gorgeous Retina display is worth it and the slate's really good at reading, web browsing and gaming. The Music player on the iPad resembles the desktop iTunes using the split-screen interface to make best use of the large resolution screen. Organizing your music library is easy and there is the option to apply equalizers. Combined with the excellent audio quality (more on that to come), that makes the iPad a promising music tool. The Music application also has its own search in addition to the general Spotlight search. As usual you are stuck with iTunes for uploading and downloading music content on your iPad. We hate to be forced to use a specific kind of software for uploading music tracks, but we already knew what we were signing for. It's unlikely that Apple would revise its policy so if you hate the iTunes dependency, then you already know to stay away from iGadgets. Apple users used to this way of doing things will find no problems here - if you're not opposed to using iTunes exclusively the experience is actually really handy and you can fill up on music in no time with the only required thing would be a stellar internet connection. We guess we won't see many raised eyebrows when we say that the audio output of the new Apple iPad is perfect. Apple has never disappointed when it comes to the audio quality of their products and its latest slate makes no exception.. The new Apple iPad is as good as iPad 2 and equally loud, and that's about as big a compliment as you can make to a device. Perfect readings are achieved all over the field when the new iPad is connected to an active external amplifier and the volume levels are almost as high as we have ever seen. And then, there's the equally impressive scores when you connect a pair of headphones. 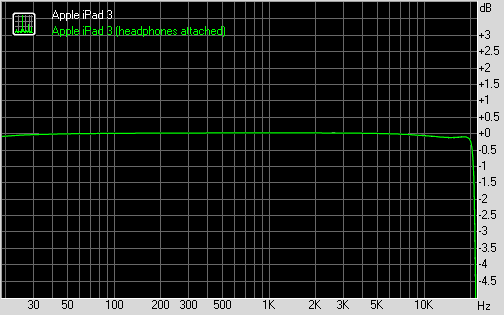 There's hardly any degradation, the stereo crosstalk being the only affected reading. Plus, volume levels remain at the same levels as when there were no headphones connected, which scores another point for the new iPad. A flawless overall performance!